The processes of additive manufacturing, or 3d printing, have been around for about thirty years. While technological advancements have been relatively steady, the manufacturing and prototyping capabilities of this new production method have not been fully utilized beyond the sphere of iterative design and prototyping. Although large-scale application has progressed slowly, many disciplines have started to experiment with the developing technology’s capabilities. Fashion designers like Iris van Herpen have been playing with the computer’s additive manufacturing implications since 2010, and artists like Sophie Kahn have used a combination of 3d printers and scanners, as well as traditional casting techniques, to create some pretty interesting sculptural works. Meanwhile, architects have started to think about printing entire buildings, and with the development of D-Shape, the world’s largest powder printer, these ideas might be realized in the next few years. 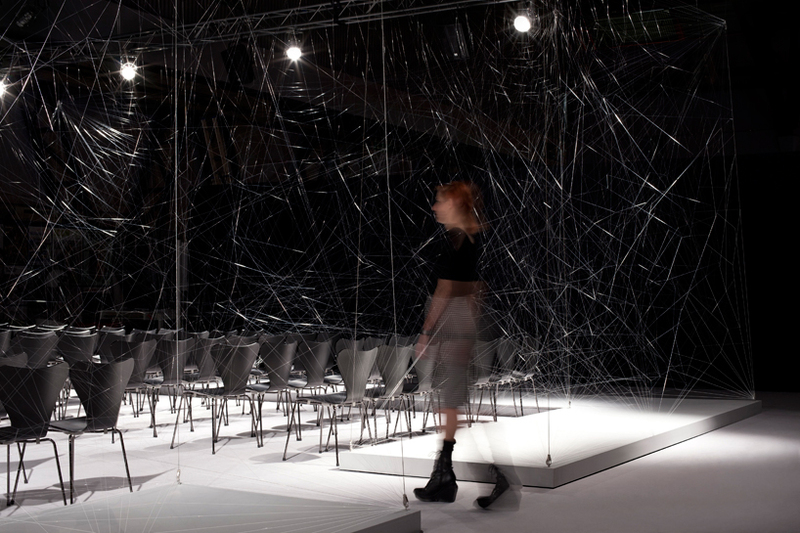 As with all aspects of design, sustainability and cost play huge roles in the efficacy of developing technologies, and one designer has a particularly interesting take on addressing this. Markus Kayser, a master’s student in product design at The Royal College of Art in London, has been translating the processes of SLS, or selective laser sintering, for solar implementation. Using a Fresnel lens to focus the sun’s rays, Kayser’s machine operates in much the same way as the typical 3d printer. Photovoltaic cells power the machine bed and light sensors, which track the movement of the sun and adjust the machine’s positioning for optimal energy use. The lens can achieve temperatures of 1400 to 1600 degrees Celsius, melting the silica in quartz sand. The abundance of energy and materials in the deserts of the world, Kayser argues, could help to lessen the issues of energy production and the shortages of raw materials, and opens the potential of desert manufacturing. Kayser also speaks about the potential for solar welding, cutting, bending, and smelting, and says that architecture could utilize the technology in the near future. The combination of natural energy sources and materials with hi-tech production methods could be a viable future application for additive manufacturing. While Kayser’s prints are mostly small objects, he wishes his experiments to be a point of departure for fresh thinking. With many industries entering the game in regard to additive manufacturing, the intersection of these somewhat divergent fields is where I believe the 3d printer will shine. Iris van Herpen collaborated with professors at MIT’s Media Lab for her elegant, otherworldly ensembles. Architecture firms like Shiro Studio and Universe Architecture have needed to work closely with Enrico Dini of D-Shape. Collaboration and cross-disciplinary experimentation consistently pushes boundaries in all areas of design because of the varying viewpoints of the people involved, and will be how 3d manufacturing with take its place as a viable and productive method of full-scale production. Varying heights relate to spatial divisions within the Niehoff studio; the cloud remains low above the workspace, vaults higher over the main presentation space, and drapes lower over the edges to create break-out discussion spaces. Grasshopper scripts will be used to optimize acoustic performance. 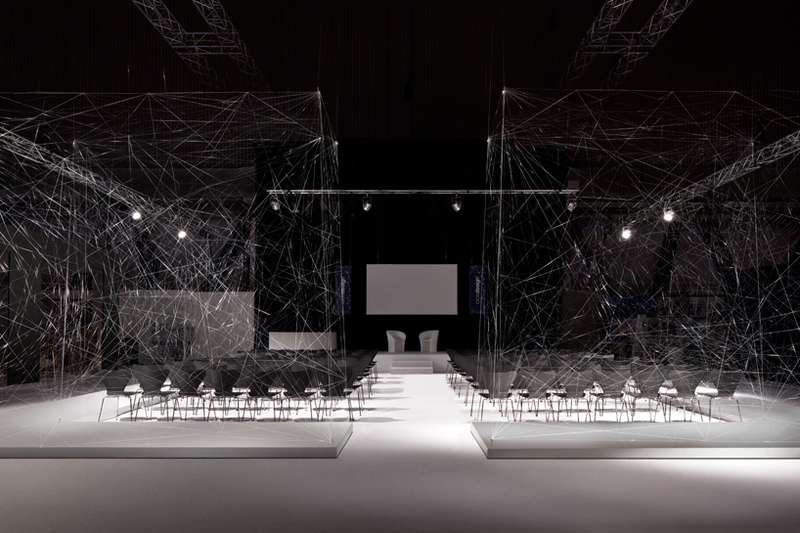 Paul Cocksedge’s “Auditorium” was completed for the London Design Festival in 2012, and consists of a network of thin nylon wires arranged to demarcate the existence of boundaries. 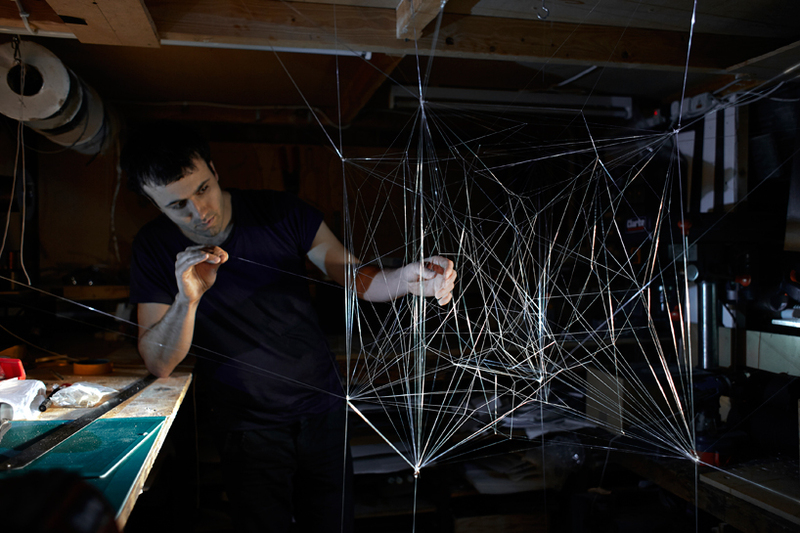 In this work, Cocksedge played with notions of exterior vs interior and attempted to move away from the conventional methods of creating space. As Javier Mondedero explains, parametric design is the creation of relationships that apply to a system in which variables can be adjusted. As these variables change, the system will attempt to generate a product that satisfies the relationships (ie “parameters”) set up by the designer. In this sense, I believe “Auditorium” can be interpreted as parametric design. Cocksedge has created a system in which dimensions can be adjusted yet a similar product is generated. The generative process in this case is not computerized, but instead completed by the artist himself. However, the design is still parametric due to the existence of a set of general rules (eg relative density, connection methods, and patterning) and variables, like dimension, which dictate the system’s performance and regulate the outcome.